We were up early on a sunny Winnemucca Saturday. Winnemucca’s day begins at The Griddle. We gave Shorty a rare treat, a walk on level streets, and then headed for The Griddle. 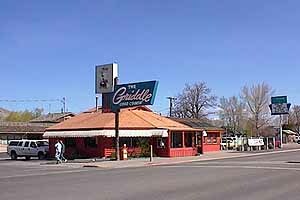 In the Nevada culture, breakfast at The Griddle is at the top of the food pyramid. This is the classic American Breakfast at its best: Ham. Bacon. Sausage. Eggs. Hot Cakes, served at the counter or at the ancient booths with window views. 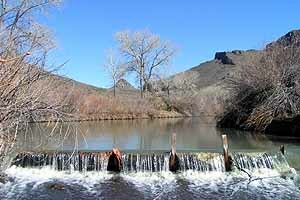 Martin Creek, near Paradise Valley. We drove north on Melarkey Street, up out of the trough of the Humboldt River with a good view of the goosenecks of the Little Humboldt. We drove north on US 95 22 miles to the Paradise Valley turnoff (Nevada Highway 290). 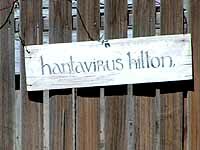 The little town is 18 miles farther along, and even in winter it is truly a Paradise. Bring your camera. Have a refreshment with Mike at the Paradise Valley Saloon, and if you like the place, buy it. 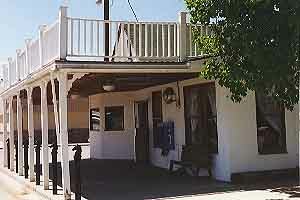 $190,000 will take the building, business and all, and this peaceful little town is very appealing. The Ranch Hand Rodeo was great fun to watch at the new Event Center in Winnemucca. Mike confirmed we were too early in the year to get over Hinkey Summit, and gave us directions instead to Martin Creek, a few miles east of town as an enjoyable spot to see. We were too early in the day for a picnic, but this would be the perfect place for one, with mighty cottonwoods to shade the stream, willows at its edge and rugged rocks all around. 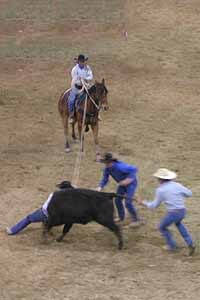 We moseyed back through Paradise Valley to Winnemucca and the Events Complex on the east side of town where the Ranch Hand Rodeo was drawing a crowd and we spent a pleasant hour watching the riding and roping of these true life cowboys. There are no more colorful folk in America than these buckaroos with their big hats, bright shirts and enormous pickup trucks. Next year I’m going to come on Thursday for the cow dog trials. 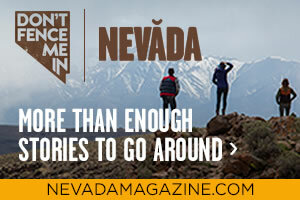 The new Nevada Magazine is out, with interesting stories, arresting photos and a host of features. Most of our group of out-of-towners were staying at the Winners, so we began the evening there, and then walked up to the Martin Hotel where the rest of the party had also got things started at the bar. The Martin maintains the tradition of the Basque Hotel, serving hearty meals family-fashion, the way they used to feed the sheep herders down from the hills. We managed to get a table for 12 and enjoyed a great feast: Bowls of soup, salad, beans, potatos, tongue, corn and baskets of fresh-baked bread preceded the entrees (steak, sweetbreads, lamb shanks, prime rib etc. ), and there was bread pudding for dessert! In this warm and friendly environment it is easy to fall into conversation with people at nearby tables, and one of our neighbors introduced us to a new element of Basque cuisine: put your beans on your salad. Well, when you have a crisp lettuce salad with oil and vinegar dressing, a spoonful or two of savory beans on top is actually quite tasty. Our compliments to the chef and let’s another glass of the red! We seem to be at a banquet at which we are all the guests of honor. around the small stage where Salut Matelot (which translates roughly as “Hey, Sailor”) was waiting: three femmes who play music of the French cabarets from the 1940s and ’50s. “Salut Matelot” at the Martin Hotel. Not only have they dressed for the parts, they have re-named themselves. 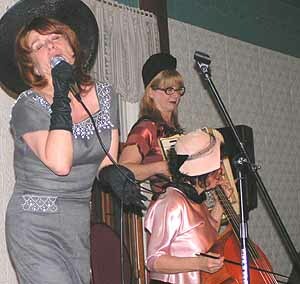 Thus accordeoniste Big Lou becomes Rita LaBlonde, Kit Robberson, who plays the viola da gamba is Bunni Day, and Carol Langston is transformed into the chanteuse Venus Dakar. These three beguiled us with the music of Edith Piaf, Mistinguet and other Parisiennes with bad relationships. They were raucous, heart-rending and delightful all at once — that’s why it takes the three of them, I suppose. It was surprising to recognize so many of their songs: “La Vie En Rose”, “Domino”, “Poor People of Paris”, “Milord” and lots of others. The only song we didn’t get was La Marseillaise, but I was ready to rise up and storm the Bastille anyhow. In the heart of Nevada we were thoroughly transported, and our walk back to the Winners was just a little bit like a stroll along the Champs Elysee. Now we’re making plans to come back in July for the harmonica men. Sign up for the NevadaGram and get the details. More info about the performances at the Martin. 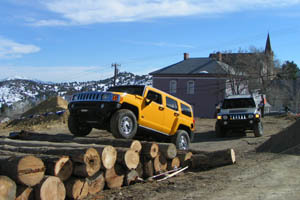 While we were in Winnemucca, Virginia City was playing host to western region Hummer dealers who came to see and drive the new models. Several dozen of the bright behemoths were on hand. 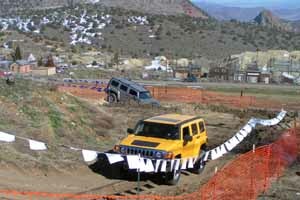 After an overnight snowfall, a friendly local asked a member of the factory team if they’d chained up their Hummers. “Chained them up to what?” he responded. No, I mean with snow chains,” our man explained. For hours on end the enormous machines crept slowly around the carefully constructed course to the edification and delight of all concerned. “It’s Sunday night, a week after the end of BM ’98. There are few of us, and the rains have stopped after 4 days. I’m exhausted. I have low morale. Everyone does. Rain. It’s making cleanup impossible. There is alot to do. Mud. Shitters are overflowing. Can’t get trucks out to the site. We’re picking up the garbage and burning it at night to keep warm while the crew drinks and tries to keep it together: they are living in tents in mud. Everything they own is wet and there is no escape from the mud. I feel responsible for bringing these people out here. I feel like a failed leader. But we have to keep going. I send someone to Reno to buy $200 worth of socks and underwear and $400 of cigarettes. I am talking to a man I don’t know who is kinda stuck out here, but seems to be very happy. Kinda mad. Not angry mad; crazy mad. I find out he is newly freed from some sort of weird prison. I received “Squaw Tom” a few weeks ago. I’ve read about half of it. It’s great!!!!!! Makes me laugh out loud on the train! Quick notes from beyond the mountains: Howard Hickson, the former Director of the Northeastern Nevada Museum in Elko has written a series of Howard Hickson’s Histories that express the character and history of the state. You’re bound to find at least one story that’s new to you in this enjoyable collection . . . Carson City also has a grass roots music venue, Comma Coffee on Carson Street across from the Capitol . . .Attention News Junkies: You’ll find the 20 most recent Nevada stories filed by the Associated Press here . . . The Carson Valley Chamber of Commerce and Visitors Authority has an attractive new website for visitors . . . 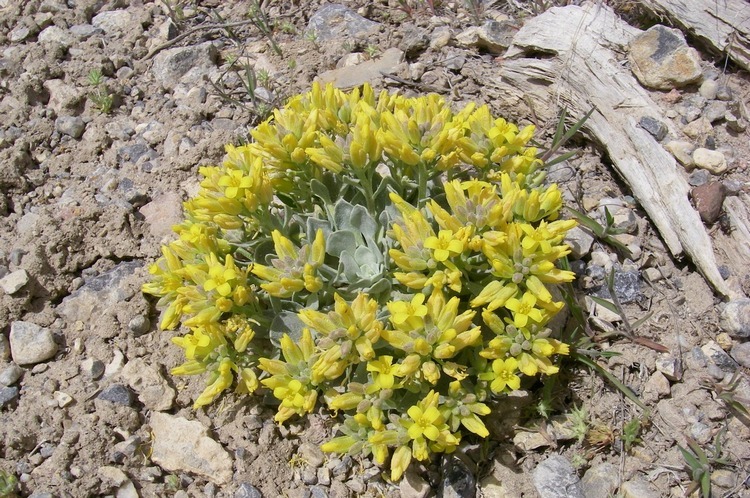 The wildflower bloom in Death Valley National Park is attracting heavy visitor traffic, especially from overseas.